The always busy musician Mr. Tchort (aka Terje Vik Schei), returns with the rest of his gang with a brand new BLOOD RED THRONE album. 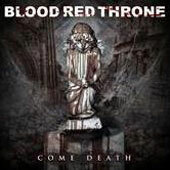 Even though I never considered BLOOD RED THRONE to be one of the top Death Metal bands, the musicians the band has and their experience is a guarantee for a more than just good Death Metal assault. Formed in 1998 in Kristiansand, Norway, the groovy death metallers have released many good albums throughout their career and after their contract with Earache Records and their previous really good album, they showed their intentions for what would follow. Come Death is exactly what the fans expected, pure unholy Death Metal. BLOOD RED THRONE's new album is exactly the place where CARCASS with their melodic, technical and groovy Death Metal meet DEICIDE's brutality. Neck breaking speed with incredible groove are the elements that make Come Death an album that will fulfill all of your sick desires. Vald's vocals are also harsh and incredible and complete the great work the band has done in the best way possible. Let's not forget that not only the US can produce great Death Metal! Europe always had a more than just good answer! As you can see, Come Death prepares you for what will follow after you push the play button with only its title and its wicked cover. BLOOD RED THRONE seem to get better as time goes by and it seems that the greats in this scene will have some trouble with them!